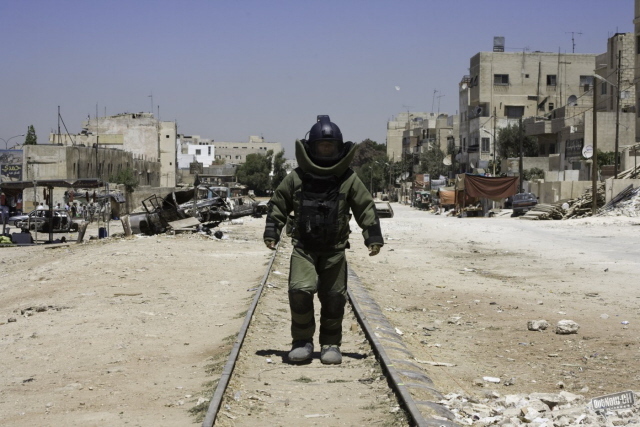 The Hurt Locker premiered in the one-two punch of the Venice Film Festival and the Toronto International Film Festival in the fall of 2008 and then made the long march through subsequent film festivals until its theatrical release in June 2009. 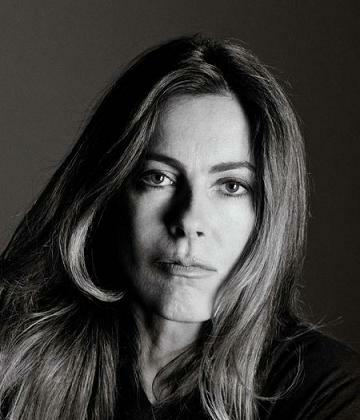 Director Kathryn Bigelow shepherded the film through each showing, giving interviews every step of the way. She knew it was a hard sell. There had still not been a commercially successful film of the Iraq war and the low budget, independently-produced The Hurt Locker had no stars and no obvious promotional “hook.” It was simply a brilliant film, and we all know that doesn’t necessarily mean anything to the box-office. You start the film off with a quote by Chris Hedges: “War is a drug.” There’s a real simplified reading of that comment, which is that likes the challenge and he thrives on the thrill. But I think it’s more complex than that. He’s the best at what he does and he’s at his best under pressure. He’s in charge and, for all the danger, he’s as in control as he ever is. When he gets back, he’s lost. That’s beautifully put. I couldn’t improve on that. I don’t know if you’re familiar with the book that Chris Hedges has written, “War is a Force That Gives Us Meaning,” it’s a great book and required reading. He talks about that you’re looking today at a volunteer military and one of the many things he confronts is, war’s dirty little secret is some men love it. This isn’t everybody, it’s just a particular type of psychological state with some men, there’s a psychological allure that combat creates, some kind of attractiveness, and it does create an almost addictive quality that they can’t replicate in any other way and are lost in any other context. However, in the case of Sgt. James—and again, I’m not extrapolating and saying there’s hundreds of thousands of Sgt. James—but the case specifically with Sgt. James is combining that kind of bravado and recklessness in his swagger and demeanor, but with a profound skill set. He is perhaps not the best diplomat but he does keep everybody alive. So it’s exactly what you said, what enables him to do what he does so well. There’s a kind of attraction, there’s a kind of addiction, there’s what I would call a price to his heroism and what that sacrifice has been for him is a flight from intimacy. He can’t be a hero in the sense that he’s the perfect father, the perfect husband and the perfect bomb tech. That doesn’t exist. There’s a real cost to his ability. I had been thinking about this before, but The Man Who Shot Liberty Valance came out on DVD in a new edition and I started to think that there are so few films about the cost of being a great soldier. That what makes someone very good on the battlefield often makes life difficult for them off the battlefield. Bertrand Tavernier’s Capitain Conan explores the same conflict and I see Sgt. James as a man in that situation: he is necessary to protect his country but he isn’t able to function back at home. Most films about the military don’t show how people like Sgt. James have such difficulty finding a place outside of war. I totally agree with you. It’s almost like a particular facet of their personality has been activated, but it’s at the exclusion of something else, at the price of something else. And I think that what was so shocking and haunting about the observations that [screenwriter] Mark Boal had on his embed in Iraq. Beginning to fabricate a script and look at those really complicated characters and the complicated psychology of what it takes to, basically, have the world’s most dangerous job. It’s very, very, very singular and yet you could extrapolate and say, there are people who like to base jump. In other words, there’s a particular kind of psychology or quality that some people thrive on that others would find absolutely terrifying. Or unthinkable, beyond terrifying. James has an aptitude for his job and a psychological makeup that allows him to thrive in it, but he is trained to do what he does. The Army never trains him to let go of it and learn to live in society where those instincts are not conducive to coexisting peacefully with others. It’s like a switch is turned on. There was an article in The New York Times Magazine many, many, many years ago about it and it didn’t occur to me until just now, as I’m talking to you, about that very fact. In that case, it was someone who was trained to kill. I think it was a profile of an individual who can’t make the distinction. That’s a very different thing, but nonetheless you have activated something and it’s the price of that activation. (laughs) His helmet, yeah. If I’m going to die, might as well die comfortable. But the more telling moment about who he is under pressure is the scene in the desert when his team is helping the mercenaries led by Ralph Fiennes and they’re attacked by snipers. Sgt. James is the guy holding them together. He’s very cool, very organized, he calms down Eldridge, the young guy who is panicking, and there is no showboating or swagger to it. Because he knows what to do and has the surety and confidence to carry it out. We had a military adviser who worked with us and he just recently saw the movie. He had many things to say which were wonderful, but first and most salient comment was that in films what he’s never seen or rarely seen or can’t remember when he’s seen but is absolutely the case in this film is the tenderness that these men who are capable of anything, and yet it is this fierce tenderness. He said it was that moment that completely won him over. I just felt it was so important to capture that tenderness. We had a pretty extraordinary script to work with and some pretty extraordinary actors, but it’s that moment when Eldridge is convinced he going to die, he sees his death imminent before him, and he’s trying to wipe the blood off the bullets and James just calms him down rather than berate him or insult him or shatter him even more. This is a man who’s shattered, he’s broken, he’s in pieces before you and, in the middle of a sniper attack, James puts him back together, psychologically props him up, and he’s back in action. And that’s another facet of that kind of psychology. Yes, there’s bravado, swagger, hubris, recklessness, a profound skill set, tenderness and a price to that heroism. So it’s a pretty compelling portrait. No, but once he’s outside that structure that keeps his emotions in check, his emotions go crazy, and his reckless actions throws Eldridge, the very guy he saved in the earlier scene, into harm’s way as he goes on this completely ill-thought-out mission. Right. He’s determined to solve it and stop the war on his own. The 150,000 soldiers there can’t but he’s going to do it. Yeah, it’s a very emotional response. Otherwise he’s kept his emotions in check. It’s like he uses the war and the pressure of his job to provide an armor, a shape to keep his emotions suppressed. Once that’s lifted, he’s no longer in charge of even himself. Right, right. But yet he longs and yearns for that shape. And he’s actually very self-aware about it. We come to realize both in the scene in the Humvee with Sanborn: “You know why I am the way I am,” and of course with his son. Those are the keys that allow us to forgive his hubris and admire ability, which is singular, his self-awareness and his capacity for tenderness and compassion. You use handheld cameras, which everyone now uses in battle scenes, but most filmmakers use it as if you’re seeing it through a documentary camera lens, looking at what a documentary cameraman would find most interesting about the scene. In The Hurt Locker, it looks like we are seeing through the eyes of a soldier or a spotter, because it’s sweeping the scene to find the most potentially dangerous situations, always scanning, always motivated by self-preservation, how to stay alive, how to keep their guys alive. Again, that really came from Mark’s embed and wanting it to feel very reportorial, wanting to protect that and preserved that. He was there as if you had gone there: terrified, you don’t know what to do. And really the environment is four dimensions of pure threat. There is no time out. You can’t even go to the green zone, there are mortar round coming through the ceiling so people sleep with flack vests. So there’s just a constant sense of threat so how do you convey that to an audience? He wrote it in such a way that made it feel reportorial and I wanted to preserve that in the shooting, keeping it very reportorial and surprising. We even blocked it in such a way that many of the cameras didn’t know where the actors were and the actors didn’t know where the cameras were, and everything was in motion and in flux, so everything was constantly surprising, just like the soldier in field doesn’t know: is that guy looking at him from the balcony calling in his coordinates or is he just hanging out his laundry? In other words, trying to protect and shoot the element of surprise, sort of like the cheetah in the wild. You don’t know where the animal’s going to go. That was the feeling we wanted to have. We didn’t want it to feel like fake “I’m not sure what’s going to happen.” The actors are trained in bomb disarmament and the crew understands the mechanics of it, but still, where is he going to go? Every first take was… it’s not that it’s surprising, but it’s genuinely, authentically, you-are there total immersion and not that kind of artificially, mechanically described cinematic experience. So it tended not to feel like cinema, it tended to feel like a reportorial experience. I really felt like I was getting a perspective of someone who was trying to survive, not someone who was observing a distance. In it, boots on the ground. Thank you, that was what our intention was and if that translated, then somebody’s done their job. You purposely do not provide a big overview. You are always about these guys in these situations. There’s no bigger picture into which they fit. Do you mean politically or ideologically? Politically, ideologically, even structurally. We rarely see their command structure because it’s always them at that moment. You’re defining the character through action as opposed to, let’s stop the narrative flow for a lot of backstory and reflection and then get back into the mix. When Mark came back, when we began to talk about what the script would be like, he said that the critical thing is to feel like this is a day in the office for a bomb tech. What’s it like? You go to the office, it just so happens your office is Baghdad and you’re looking at a 300 meter containment and a 300 meter bomb disarmament are and you’re walking down on a 1-5-5 [bomb] that you don’t know if it has a secondary attached to it, is live, not live, is really a bogey for a sniper or is just something left there from who knows when, completely innocent and benign. So it’s a sense of trying to keep it as authentic and realistic as possible. Apart from the sense of chaos you get in the sniper scene, so much of the film is about stillness and calm, not about tension so much as the patience of these men, and you are so focused on their concentration. It’s something that one of the bomb tech sergeants said to me. What he was looking for in his BOD team is the ability to make instantaneous decisions under extreme pressure again and again and again. It has to be the right decision, there is no margin for error. So you’re looking for someone with a tremendous stamina, and aptitude and skill set of course, but that ability again and again and again to make those kind of decisions. So I think that is something that they focus on and will winnow down to those individuals that are capable of functioning like that. It’s pretty startling. And you are giving us their experience rather than giving us a spectacle, which is what I love so much about the film. I think it would defeat the tension. If you don’t feel like that at moment, which is the feeling you have over there and Mark had, every second of the day. You didn’t know what was going to be a bogey, what was going to be absolutely nothing, what’s potentially a threat and what isn’t. You’re on point 24/7 and I think that’s very unique and specific to this particular conflict. Back to your question of politics and ideology, I think there’s that old saw, there’s no politics in the trenches. It was important to us to be, again, reportorial, and regardless of your opinion about the particular conflict, you can look at these men and their job and their potential sacrifice and the lives that they are saving by the bombs that they’re disarming and the heroism that they perform and just look at it on the face of that. I think that there’s something pretty compelling about having that information and being able to make a fairly informed opinion about, it nothing else, the process of bomb disarmament and the fact that these men are volunteering to do that. The roadside bomb and the IED is the weapon of choice for this particular insurgency, it’s a war of bombs. And I think that fairly little is known about the process, the protocol, the individuals to the public at large. If you have done a tour of duty you might have some understanding, but I think… Basically, knowledge is power. It’s a long way of saying that. Let me just throw this out, another film I just revisited that I think tries to do the same thing in its own way that you do with your film, which is give us the soldier’s experience: Sam Fuller’s The Steel Helmet. Sam Fuller’s the greatest. Yeah, it’s total immersion and I think that that’s maybe the greatest strength of the medium, that ability to give you an experiential look, to transport you completely to a particular event/venue/experience that that you would not normally have or desire, because it’s perhaps too threatening, too volatile. Yet you can really have an experiential glimpse at that particular aspect, in this case a war. I think it’s a great gift that film has, so you can walk away with a more informed perspective. It’s total immersion filmmaking, is what I would call it, or true fiction or something like that.